"The movement believes in armed jihad as a means for expelling the occupier, and calls on public opinion and agencies and international institutions to respect this right... of all peoplese to resist occupation, and to distinguish between that and armed crimes which target innocent civilians." "We believe in a necessary link between military efforts and political action as two mutually supportive instruments for achieving the goals of resistance for liberation and salvation and preventing the fundamentalist movements [al-harakat al-asuliya] from harvesting the fruits of the resistance." "We confirm the necessity of continuing the killing until the exit of the last soldier from the occupying armies, and to not negotiate with the enemy except with an agreement of the factions of the jihad and the Iraqi resistance; and under the appropriate circumstances and conditions." The program also rejects sectarianism (a sharp contrast to the fierce anti-Shia rhetoric in the al-Qaeda rhetoric) and calls for peaceful dialogue among all factions and an absolute rejection of the use of violence to settle internal political disputes. The Hamas Iraq program seems to be about as clear a statement of the position I was describing as possible: against al-Qaeda and the Islamic Iraqi State, but for armed insurgency against the American occupation until the occupying armies depart; against negotiations now but for them under the appropriate conditions and within a united insurgency front. I'm not sure why I haven't read about this anywhere else. Meanwhile, the leadership of Ansar al-Sunna released a statement directed towards Sunni tribal leaders explaining that as soon as they heard about the transgressions against Iraqi Sunnis by self-declared mujahideen they had intervened to put an end to it. The statement blames individuals rather than organizations for the transgressions, and warns Sunnis not to fall victim to those trying to stir up fitna and infighting, or to blacken the name of the jihad. The solution to these problems, it argues, is not to play into the hands of the enemies of Islam (i.e. the United States) or to cooperate with American forces, but rather to cooperate with good Muslims (i.e. the insurgency) to pass judgement on the offending parties. This seems to be part of the coordinated campaign by these insurgent factions to respond to the grievances of Sunni tribal leaders and to keep them on board (or bring them back on board) the armed jihad. All to say that the struggle over control of the Sunni insurgency continues to heat up, but it doesn't really mean what the administration's spinners want you to think it means ( Frederick Kagan: "At this early stage, the most important positive development is a rise in hostility to al Qaeda in the Sunni community.") There's this growing US government line that Iraqi Sunnis are turning pro-American. So hold your breath and have a look at the most recent major public opinion survey (carried out just last month), 97% of Sunnis oppose the US presence in the country, 97% say that they have little or no confidence in US and UK occupation forces, and 94% say that the presence of US forces in Iraq makes the security situation worse. Only 5% expect putting more US forces into Baghdad and Anbar to improve the security situation (68% expect it to make things worse, 27% think it will make no difference). Only 2% blame al-Qaeda for the violence, and none (at least statistically significantly) blame Sunni insurgents. 94% of Sunnis say that attacks on coalition forces are acceptable, while 66% consider attacks on Iraqi government forces unacceptable (showing starkly the political line that the insurgent factions are laying down against al-Qaeda). Bottom line: local opinion likely is turning against al-Qaeda, but the beneficiary is more likely to be the insurgency factions than the United States, no matter what the Weekly Standard tells you. "Meanwhile, the Islamic State of Iraq has issued an appeal to all the insurgent factions to pledge fealty (baya), specifically focusing on the Islamic Army of Iraq and Ansar al-Sunna but appealing to a wide variety." The reason I ask is that the graphic you posted isn't necessarily from the ISI, and in fact I think there's reason to believe it isn't. The ISI has tons of supporters online, and the context that I've seen that and the two other graphics in is a "campaign to get 6,000 signatures supporting the unification of the factions under the banner of the ISI." Have you seen anything from al-Furqan or the ISI "ministry of information" or anything more official that would indicate that the ISI itself is really behind this? It seems a little ham-handed and out of place, especially given how conciliatory Baghdadi was in his speech, not mentioning the baya even once. It seems much more likely that it's the work of some overzealous fans. AG - you're right, from everything I can tell, this was circulated by a supporter of the ISI (I like your phrase, "overzealous fans"), not by the ISI itself. My mistake - I've corrected it above. Does the Hamas/Iraq political program include the demand the resistance be accepted as the sole, legitimate representative of the Iraqi people? If not perhaps the absence of such a demand is significant. And does the program give any hint of how HI envisage post liberation arrangements? Significantly, the recent ISI "reconciliatory" statement was immediately followed by the announcement of the ISI "cabinet". Once again ALQI leading from the front. Re the Anbar Awakening. The difference between this and past clashes with ALQI is surely that the shiekhs are now supplying the recruits for the local police force and the military Emergency Response Units. Surely this means in effect the Iraqi Govt and the US is training a future Pesh Merga for the Sunni Arabs. And according to reports the Awakening is seguing this into an "Iraq Awakening" and is beginng to articulate its own political program. 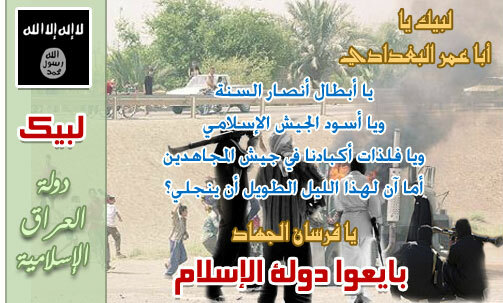 The Anbar shiekhs and ALQI seem to be facing off for a battle for leadership/control of the Sunni governorates. Surely the non ALQI insurgency can't afford to be left out of this equarion? does anyone think that maybe the CIA threw a bunch of money at these tribal sheiks to come over to our side and that actually it may be a black ops program to split the sunni insurgency? Anon ..very good point. It's what the CIA did in Afghanistan with satisfactory results from their point of view.